Fitted kitchens in Nottingham from Kitchen Solutions can be designed to have a colour scheme that matches the rest of your home or highlights the quality of this space. We have been exploring some of the latest trending colour schemes for the year ahead and how they can transform the look of your kitchen. For over two years now matte black has been a fixture in designs for new fitted kitchen designs in Nottingham, with the colour being described as ‘sleek and bold without being too cool for school’ by House Beautiful. Matte black adds contrast to typically white, crème or lighter colours in your kitchen. 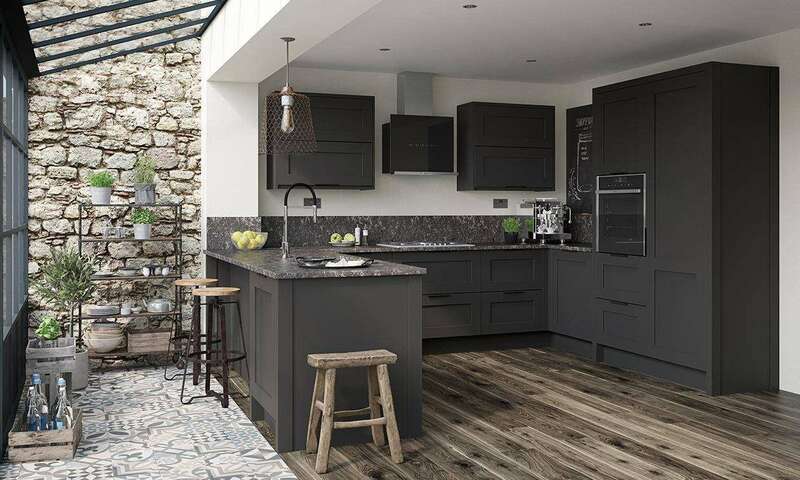 An industry survey also revealed that searches for black and other darker colours for kitchen design, are up an astonishing 93% in the last 6 months. Going for Gold in fitted kitchens in Nottingham! If you are looking for a colour that goes well with black or darker colours, we believe you can’t go wrong with the timeless gold or copper hardware and accents. Black and gold together gives your kitchen design a touch of elegance. One of the predictions of industry experts for this year, is the emergence of green as a major part of colour schemes in kitchen designs. The team here at Kitchen Solutions have their fingers on the pulse, so we can advise you all about the latest popular designs of fitted kitchens in Nottingham. Take your first steps towards an out of this world kitchen and contact us today and we can arrange a free consultation about your ideas.